We've Got the Opener Repair Experts Who Can Fix It. Call Us Today! Your opener performs a vital function - don’t let wear and tear lead to a total breakdown of your garage door system. 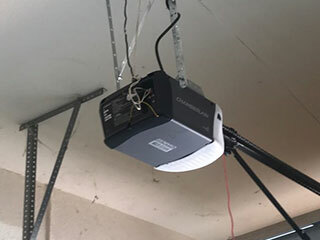 Most garage door openers rely on either a chain-drive, belt-drive or screw-drive system to operate. Understanding the differences between these drive types and choosing the one that’s right for your needs and budget, can save you money in the long term. Where chain-drive systems are the most affordable and highly reliable, they also make the most noise – so if you’re not planning on opening and closing your door too often, this may be the model for you. Belt-drive systems offer almost complete silence, which makes them a good option for regular garage users. Between those two are the screw-drive systems: perfect for if you don’t mind a little noise, and are looking to reduce the effort of regular maintenance. For many customers, it’s the specialized opener features that help seal the decision when choosing a new unit. For example, LiftMaster and Genie models offer rolling code functionality so that the security codes automatically change every time you open or close the door – this keeps your property secure by ensuring only you or those you trust have access. Other features, such as WiFi compatibility and a backup battery system, can be just as useful, allowing you to control your door remotely and feel confident that your access won’t be compromised when you're not at home. An unresponsive garage door can be a serious hassle, wasting valuable time and leaving your home at risk of intruders. It can also cost: the cause behind a total breakdown can take time to diagnose and even longer to fix. Our team of technicians have the answer. Speak to us today about scheduling a regular maintenance plan to fit your model and lifestyle. They'll arrive on site ready to examine the various components of your opener, conduct a range of safety test, lubricate the chain drive (if you have one) and carry out minor repairs as they go. They'll also check the condition of your motor gear and circuit boards, and ensure your sensors are doing the job they're designed to do. Whether you need a new opener installed, maintained or repaired, call our specialists Garage Door Repair Cedar Park now for service you can trust in Texas!